In orthodontic treatment, teeth that are tipped, too high, too low or misaligned are moved into correct positions. These tooth movements produce changes in the thickness of the gingiva (gum tissue) and alveolar bone (tooth-supporting bone), gingival height relative to the crown of the tooth and the form of interdental papilla (gum tissue between teeth). Thus, it is important to recognize that orthodontic tooth movement directly influences the form of the supporting bone and surrounding gingiva. Severe gingival recession is noted in the left posterior area. Gingival recession is said to be caused by excessive pressure while brushing, but there is no gingival recession on the right side. The root cause of this problem is the buccally tipped upper posterior teeth that are in crossbite with the lingually tipped lower posterior teeth. The upper posterior teeth displaced out of the alveolar bone due to crossbite were moved into the bone as the occlusion was improved. 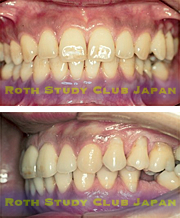 The gingival recession was also reduced. When teeth are moved with due consideration to the periodontal tissues, periodontal health can be promoted, as shown by the improved gingival level, which in turn will increase the longevity of the teeth. This patient has problems with the thickness of the alveolar bone and gingiva in conjunction with posterior crossbite. 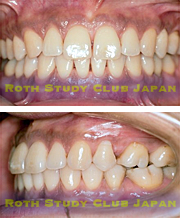 Dental arch expansion without tooth extraction is a common form of treatment. However, this is detrimental to tooth preservation. Disharmony between the upper and lower arch widths, as seen in this case, will overstress the joints and muscles.